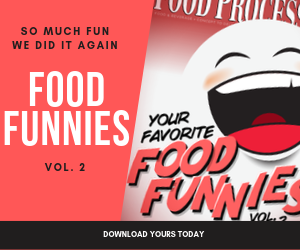 August edition of Food Processing's Food Funnies, a monthly feature guaranteed to give you a good laugh. Congratulations to Lorrie-Ann Fisher for the winning July Caption! I don’t care how thirsty you are, I still think the water cooler is your best option. Well with All the promises Both Democrats and Republicans been giving so far this year it looks like this is one they have overlooked so far and this is one we really could have used to saved some more jobs. I’m not gonna break it…YOU break it! What a stupid idea , who would ever pay for rain water? Uh, maybe we can convince Nancy from Accounting to do it. We shipped a bunch of the model 2000 to Asia, now there on Hold, until we install and off switch. Remember, if you break it, you gotta write up the incident report for the no glass register.